Warning- this one is a bit graphic. I am somewhere between two and three years old. I am watching my ladybug curtains wave at me as the breeze visits my room. I am the mama of my stuffed animals. The babies are all sleeping under my blankie. 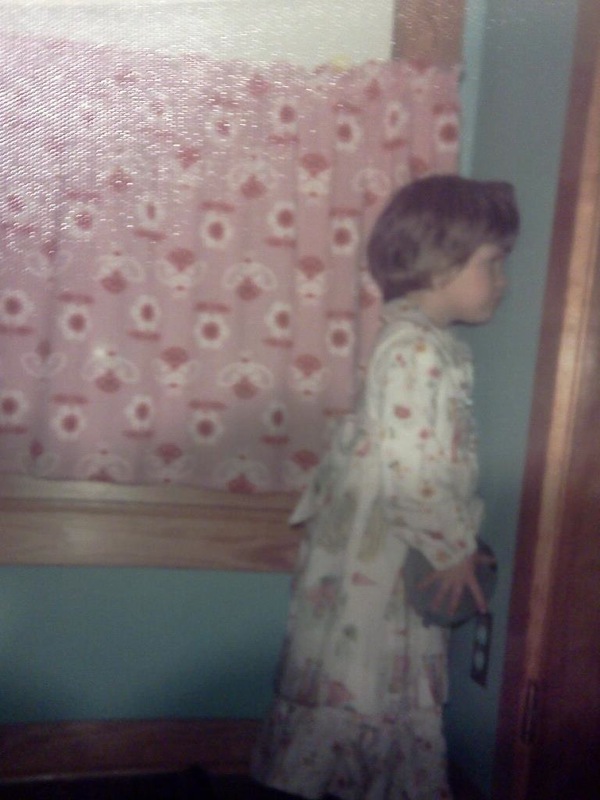 I am wearing a prairie dress that my mother has made for me. I want to see myself in the mirror again. There are two parts to the dress- it has an apron like Alice in Wonderland's. I am Alice in Wonderland as I sway back and forth in front of the mirror and chant a toddler's song about the beauty of it all. The man my mother got married to in the living room last week peeks into my room. He smiles. I smile. He is nice to me. He always has a bottle of Pepsi and lets me have a sip from it. He wants to come in and play. He sees my babies on the bed and asks if he can go to bed with them and will I tuck him in too? I am franticly searching for another blanket to cover him up with. He is a real live baby. This is the best kind of pretend. I am on the bed pulling hard on the blanket I have found in the closet. I am telling him to lie still and be a good baby while I tuck him in. I am breathing hard with the labor of caring for my giant baby. He does a good job of being still until he grabs my leg from under the blanket. I shriek and neighborhood dogs bark. He laughs and unfurls his long legs and grows into a man again as he gets off of the bed and closes my windows. He says he wants to play another game. We have to take our clothes off. I don't mind. I take my clothes off all the time. He has a different thing on him than I do. I stare at it. What is that? I think it is funny looking and I point and chuff at it. He takes it in his hand and swings it around and makes elephant noises. I am laughing out loud now. He wants to know what sound my animal makes. I touch it and make a loud ROOOOOAAAAR! We both fall into a fit of giggles. I am hyper now. I have a friend and we are very silly together. He says I can be a lion and an elephant too. All I have to do is sit on his lap. He brings his animal up through my legs. It isn't as floppy as it was before. It's warm and hard and a little sticky. He says I should pet the elephant so that the lion knows it is friendly and won't try to eat it up. I give it a pat. Before I can take my hand away he covers it with his own and shows me how to pet the elephant just the way it likes it. He tells me not every little girl gets to play this game. I am special. If I tell anyone he won't play with me anymore. He won't be my friend. I like being special. My mother never holds me or plays with me. I do as he says. Maybe if I do we can play babies again.